Chanteur Country US né le 9 Février 1963 à Marietta (Georgie). Tritt fell in love with music as a child, teaching himself how to play guitar when he was eight and beginning to write songs when he was 14. Travis was determined to have a musical career, but his parents didn't encourage him to follow his instincts. His mother didn't mind that he wanted to perform, but she wanted him to sing gospel; his father was afraid there was no money in singing. When he was 18, he tried to settle down, work, and have a family but was unsuccessful — he was married and divorced twice before he was 22. He continued to play music while working various jobs, including one at an air-conditioning company. The company's vice president was a guitarist who gave up hopes of a musical career and urged Tritt to follow his dreams. Tritt quit his job and began pursuing a career full-time. In 1982, Tritt began his pursuit by recording a demo tape at a private studio which was owned by Danny Davenport, who happened to be an executive at Warner Brothers. Davenport heard the Vocalsist's songs and was impressed, deciding to take Tritt under his wing. For the next several years, the pair recorded demo tapes while Tritt played the honky tonk circuit. The singer was developing a distinctive sound, adding elements of country-rock and Southern rock to his honky tonk. Despite his success, the Nashville music industry was hesitant to embrace Tritt. His music and stage show owed too much to rock & roll, and his image didn't conform with the behatted legions of new male singers. Nevertheless, Tritt had a breakthrough success with his second album, 1991's It's All About to Change. Prior to its release, he had hired manager Ken Kragen, who also worked with Lionel Richie, Trisha Yearwood, Kenny Rogers, and We Are the World. 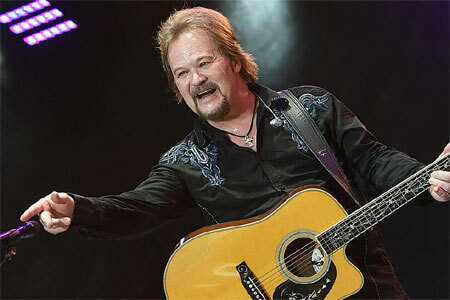 Kragen helped market Tritt in a way that appealed to both country fans and a mass audience, sending It's All About to Change into multi-platinum territory. T-r-o-u-b-l-e, Tritt's third album, was released in 1992. Although it didn't match the success of It's All About to Change, it had the number one single, "Can I Trust You With My Heart," and went gold. Tritt bounced back in 1994 with Ten Feet Tall & Bulletproof, which went platinum, spawned the number one single "Foolish Pride," and marked his highest position, number 20, on the pop charts. His 1995 compilation Greatest Hits: From the Beginning went platinum within six months of its November release. Restless Kind was released in 1996, followed two years later by No More Looking Over My Shoulder; Down the Road I Go was issued in fall 2000. Live in Concert appeared in 2007 from Big Bang while later that same year Category 5 released a new studio effort from Tritt called The Storm.